Continuing my series about lovely hotels around the world that you really should stay in, today we’re at the Kata Beach Resort & Spa in Phuket, Thailand. Phuket is a large and very diverse island. That means if you want to party up a storm, get active with watersports, explore temples and places of interest, indulge in gourmet food, shop, lie on the beach – or any combo of them, Thailand has plenty to offer. 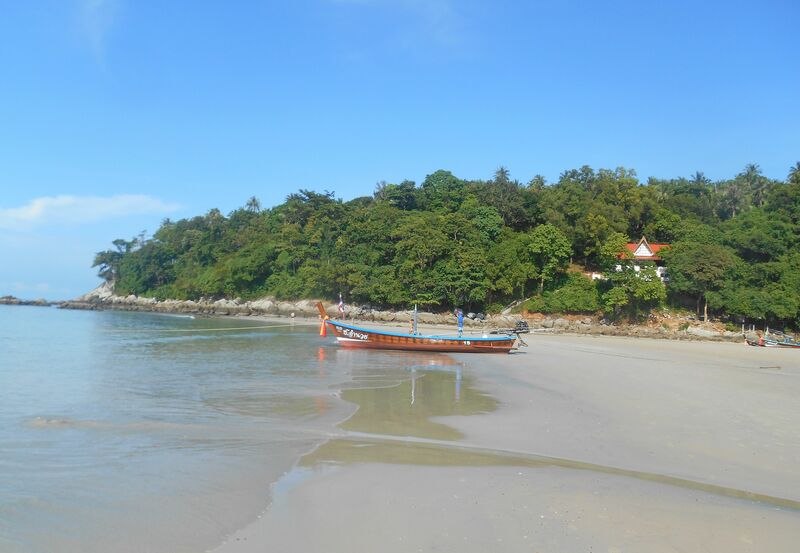 We particularly like the Kata Beach area, having visited a few years ago. 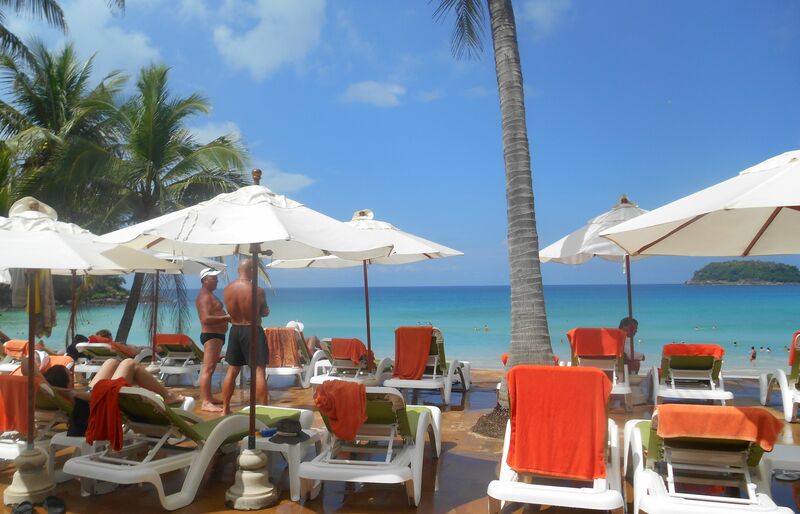 The beach is amazing, there are plenty of restaurants all serving great, well-priced food and the shopping’s also good. Plus it’s a bit quieter than some of the more party-focused areas of the island, there are no clubs and after a certain time of night a peace washes over the area. Love the peace. We’d spotted the Kata Beach Resort on our ambles around the town last time and put it on our wish-list of hotels to stay in if we ever returned to the area. Sometimes wishes do come true. So here’s what’s good about it. Set right on the absolutely stunning Kata Beach (more of that later), the hotel couldn’t be in a more convenient spot. You’re a minute’s walk (if that) from your room to the sand and only a few minutes walk away from a cluster of lovely beach restaurants. If you go in the other direction out the front of the hotel you’re right in the middle of the shops, markets and a generous selection of other restaurants. 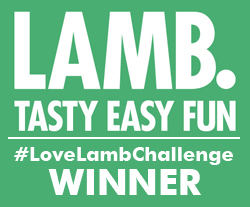 Perfect if you love eating out, like us. A short walk, a short inspection of what’s on offer and you settle down to a delicious meal every time. At lunchtime we liked to amble down the beach and sit barefoot looking out at the sea (we soon stopped even taking our shoes with us), tucking into a range of Thai favourites. 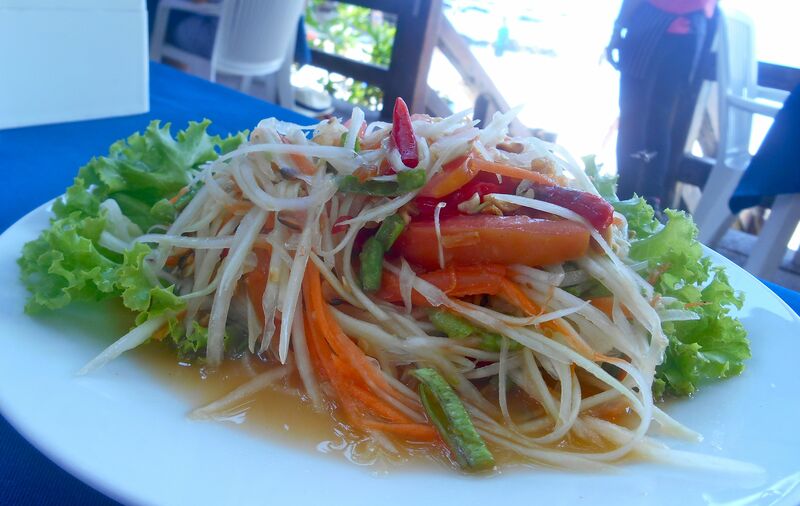 Top of the list was the spicy green papaya salad which tastes like health on a plate – in a good way. 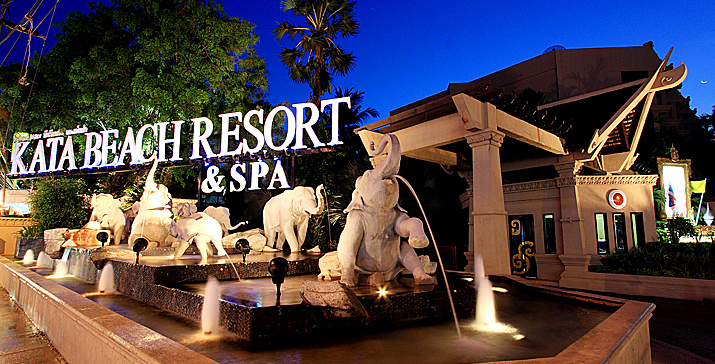 The hotel is set back from the main road behind the amazing elephant fountain. So you’re only steps from the buzzy nightlife as well as being able to retreat into the cocoon of peace that surrounds the hotel. The food is really varied in Kata (more so than in many other parts of Thailand I’ve visited) and standards are high (more details coming soon in another post). 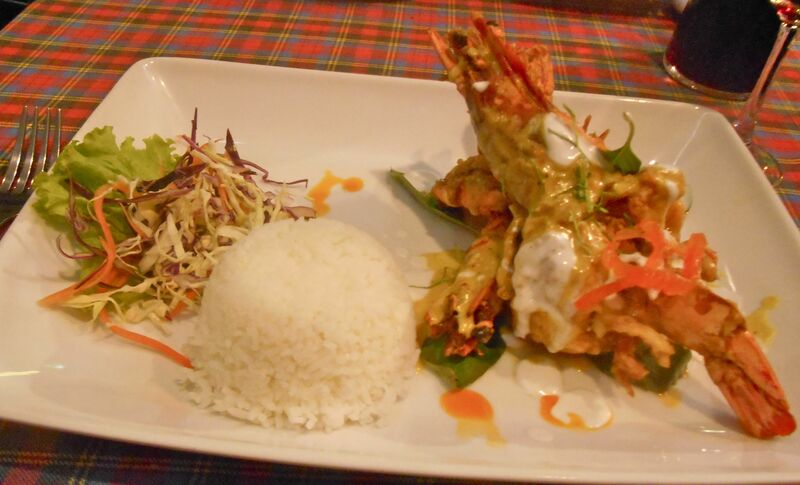 Here’s a fabulous king prawn dish we had for dinner one night in a restaurant on the main road. 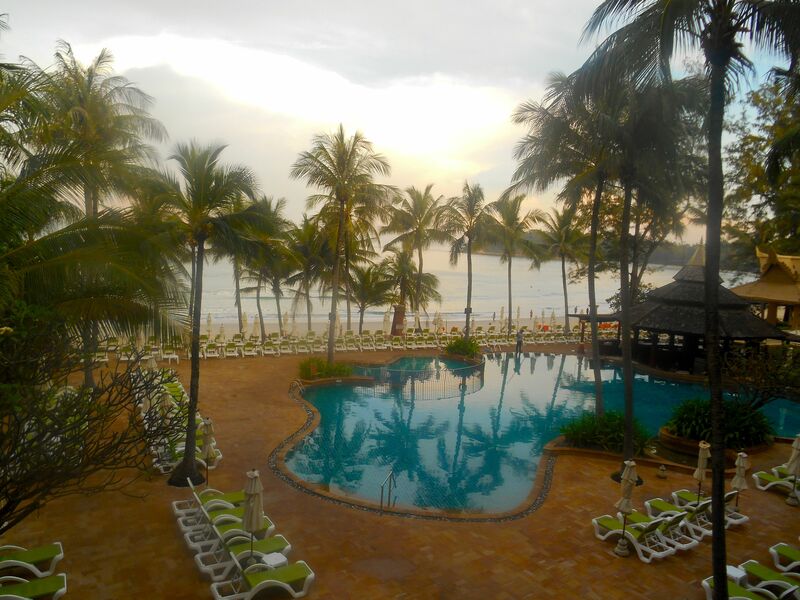 Kata Beach is nothing short of spectacular and the hotel is right on it. A sweeping bay beckons in front of you with the beautifully blue and warm Andaman sea just waiting for you to plunge into. Here’s a picture I took from my sunbed using my panorama function. I love a good daily walk and the extent of the beach meant about 45 minutes of power walking – with some strolling and several stops to take in the sights, of course. This is near the far end where a little house that intrigued me nestled in the trees. I want to know who it belongs to. Of course, this is allied to both the position and the beach. Wow! To have views like this right in front of you wherever you look is totally uplifting. Here’s my daily vista through the leaning palms. We arrived around 8 at night at Kata Beach and the first thing I did was walk through the room to the balcony door and out to the sound and sight of the sea. The perfect inspiration to go to bed and wake up to. 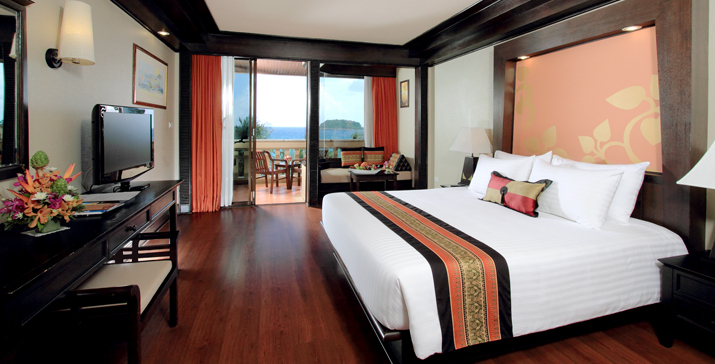 The rooms are spacious with extremely comfortable beds. Boy did we sleep well here. Air conditioning is good and easily adjustable, there’s a safe to leave your valuables in (always vital for me) and there’s a kettle with tea and coffee replenished daily. Plus an extremely chilly fridge to ensure there’s always a cold one to quench your thirst on those sultry Thai days. All the comforts of home, basically. Plus the wifi signal is excellent, another necessity for an internet junkie like me, after all I do have to blog and post on social media, don’t I? Top tip: make sure you specify you want a sea-facing room. It costs a little more but is more than worth every penny. Oh and here’s the early morning view from our balcony – before the serious suntanners hit the pool. As you can see our room looked over the pool to the sea. A real indulgence having two swimming areas right on your doorstep. The pool is lovely and warm and big enough to stretch out and have a bit of a swim. And it has the must-have swim-up pool bar. The joy of sitting in the water sipping a cocktail! 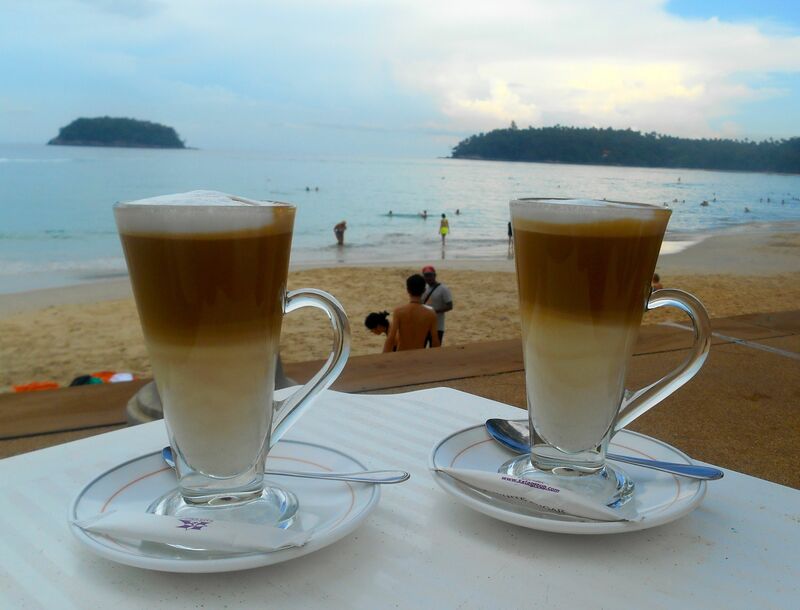 The bar also does the most wonderful lattes, just what we needed to get our day off to the best start. Here’s the view from the bar across the sunbeds to the azure sea. This was just after a rainstorm, which we sheltered from under the bar’s covered area. Very handy. How I love hotel breakfast. You’ve got plenty of time and you don’t have to do anything yourself, except decide what you want and eat it. Kata Beach Resort’s international buffet took some exploring every morning. 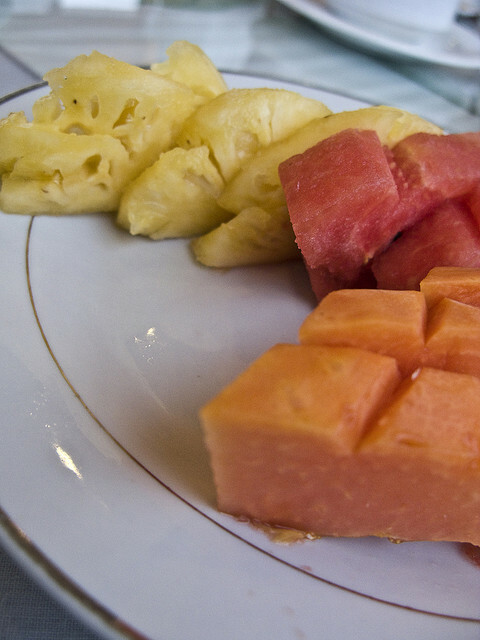 Before doing that I helped myself to a huge plate of tropical fruit…I think I ate more papaya than the average person does in a year! There was also a good selection of pastries and a range of Western options including, sausages, tomatoes, potatoes done any way as well as freshly cooked bacon and eggs made to your demand at the egg station. Being in Thailand I embarked on eating the Thai version every day – a helping of noodles or rice (or sometimes both!) sprinkled liberally with fish sauce and chilli. Amazing how I got into this, breakfast doesn’t seem the same anymore! It’s fair to say you’re tripping over people wanting to give you a massage in Phuket, here you don’t even have to go looking for them. At the hotel there’s a little hut right on the beach where you can lie down, breathe in the sea air and listen to the soothing waves while all your cares are massaged away, though it’s hard to have any cares at this stage. An hour of intense massage that leaves you feeling totally revitalised costs 300 baht. That’s about £6. Really! Then there’s all the beach sellers. You slowly watch the beach waking up as dozens of industrious vendors parade their wares up and down all day. They’re always pleasant, happy and take no for an answer without too much hassle. Needless to say the products are such good value (and there’s always room for bargaining) that I usually ended up buying something anyway. Summer wardrobe replenished! If you’re more the kind of person who wants things made just for them, you’re also in the right place. There’s a tailor on-site and he’ll make sure your garments fit perfectly. Choose your fabric and he’ll measure you up and provide several fittings to make sure you get exactly what you want. It’s good value, too, my husband had three pairs of trousers made for 3,900 baht which is just under £80. I’ve realised that this all sounds as much like a spotlight on Thailand generally as a review of the Kata Beach Resort. Well, that’s because that’s exactly what you get here. The best of everything that’s great about this wonderful holiday destination. 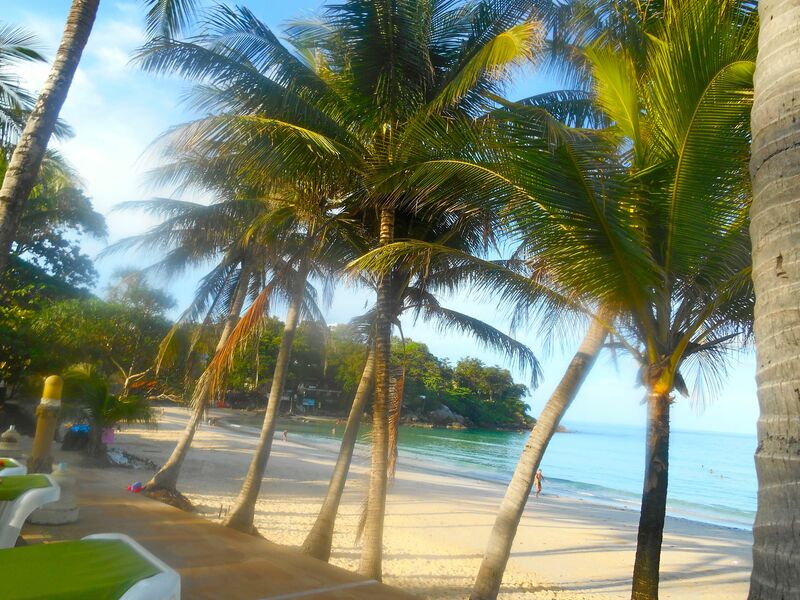 Aah how I miss Kata Beach. Do you have a favourite part of Thailand? Have you stayed somewhere special? I’d love to hear about it as I’m already thinking about my next visit there – so do get in touch.